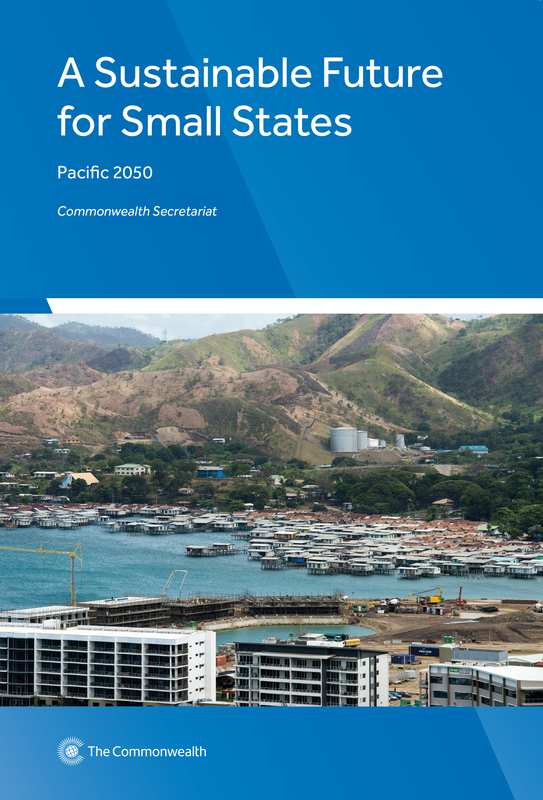 A Sustainable Future for Small States: Pacific 2050 is part of the Commonwealth Secretariat’s regional strategic foresight programme that examines whether current development strategies set the region on a path to achieve sustainable development by 2050. The study analyses whether Commonwealth Pacific small states (Fiji, Kiribati, Nauru, Papua New Guinea, Samoa, Solomon Islands, Tonga, Tuvalu and Vanuatu) will achieve the Sustainable Development Goals. It reviews critical areas that can serve as a catalyst for change in the region: governance (examining political governance, development effectiveness and co-ordination, and ocean governance); non-communicable diseases; information and communications technology and climate change (focussing on migration and climate change, and energy issues). In each of these areas, possible trajectories to 2050 are explored, gaps in the current policy responses are identified, and recommendations are offered to steer the region towards the Pacific Vision of ‘a region of peace, harmony, security, social inclusion, and prosperity, so that all Pacific people can lead free, healthy, and productive lives’. 2.3 Can the Commonwealth Pacific small states achieve the SDGs?